Since I was lucky enough (sarcasm) to move after my sophomore year, designing a class ring was, to say the least, challenging. 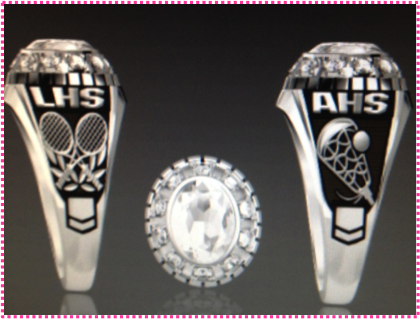 I tend to be a perfectionist so designing my ring became an obsession. Since I spent exactly half of my High School Career at my old school and half at my current school, I figured my ring should accurately represent the time spent at both schools! I did one side to represent each school and then my birthstone in the center! I contemplated having a pink stone in the middle…..just because, well, it’s pink. But I figured my birthstone would match everything and is more “timeless”. I played varsity tennis at LHS and although I played lacrosse there, it wasn’t for my school. My new school, AHS, has a lacrosse team and I will be playing for them for my junior and senior year! Because I wasn’t able to fit my name or my graduation year on the outside of my ring, I had “2013” and my initials “SPH” engraved on the inside. I love how it turned out and I couldn’t be happier! As cheesy as this shot is (it kinda looks like my best friend D and I are getting married!) the photographer wanted to capture a shot with both our class rings during our BFF photo-shoot (blog post to come)! 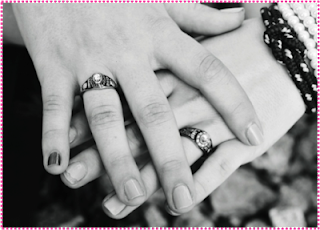 My ring is the one on the bottom and the hand with all the bracelets! How did you make your class ring original? Do you absolutely love it?